With a beautiful starlit sky guests were ready to head out and explore the Timbavati at night. About an hour in on the drive we came across an adult hyena which we followed. 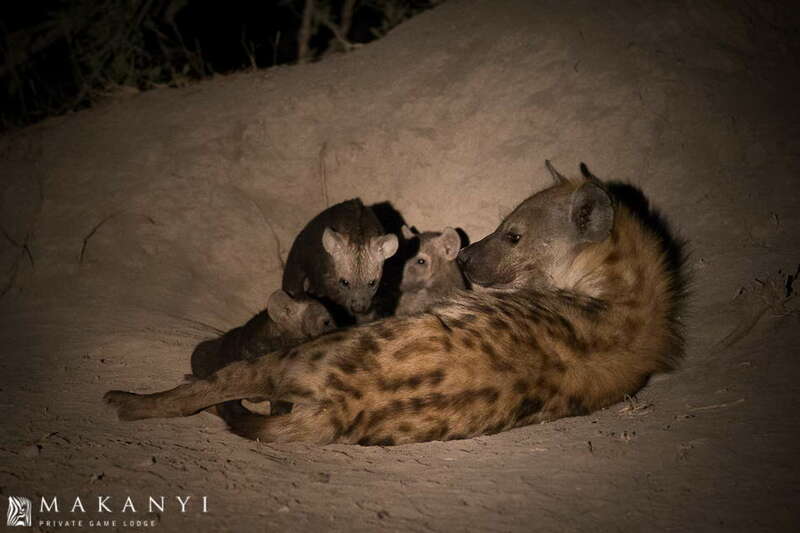 As we followed the hyena it led us to an active den site which had been abandoned for some time now. As we got closer to the den we could see that there were 2 young cubs busy suckling on mom meters away from the den’s entrance. As we edged closer to the den, mom was getting a bit nervous with us being around, so we positioned the vehicle at a distance she was happy with. As we watched the cubs suckling, 2 more pups emerged from the den and joined the other two suckling. After the cubs had finished, they interacted with each other before disappearing down the entrance for the night. It was a wonderful opportunity to watch this kind of interaction with an animal that is often just passed by.